Batman’s Batmobile is installed with hundreds of gadgets and special functions which he uses to stop villains from taking over Gotham City. It is one of the superhero’s most technologically advanced crime-fighting asset in his crime-fighting crusade and is heavily armored and ready for any vehicular hot pursuit. Now for real world crime busters we like to call “police officers”, stopping a criminal running amok across the city or a drunk driver trying to get away from an over-speeding ticket is a tedious task. Our friendly neighborhood crime busters and law enforcement agencies have tried various (sometime sketchy) ways to stop a driver who doesn’t want to be caught. They’ve tried tire-deflating stop sticks, an angle grinder, and there’s that PIT maneuver which sends a car spinning out of control, or worse – to a huge wreck of fire and debris. Good thing an inventor came up with a device that could help solve this problem. 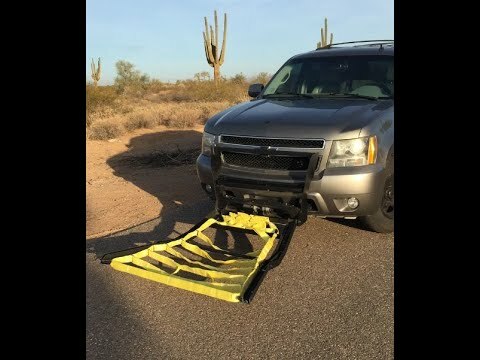 Presenting, the Police Grappler Bumper (PGB) – “a safer, more controlled way to bring a fleeing car to a halt”. PGB’s inventor, Leonard Stock, said in an interview with Fox News that videos of police chases have inspired him to create such a device. One incident which struck him the most was that of a chase where an innocent motorist got tangled into the chase and got t-boned. He became very aggravated that these kinds of things could happen even. He said he woke up at 3:00 in the morning obsessed about this brilliant idea that was the Police Grappler Bumper. How could this Y-shaped yoke actually bring a fleeing vehicle to a stop? Well, here’s how. The PGB is attached to the front bumper of the pursuit vehicle carrying a tow rope-like webbing. The most exciting part is when the pursuit vehicle comes close enough so that the yoke flips down as the webbing snags on the rear wheel of the suspect vehicle. The webbing gets entangled on the rear wheels and at the same time, locks the suspect vehicle’s wheels. Once the pursuit vehicle slams on its brakes, the suspect’s vehicle is dragged to a complete stop. It may seem very dangerous (and terrifying) for those inside both vehicles, but according to the inventor, it’s going to be the most controlled stop that this device can achieve. The same goes for the webbing. Well, nothing’s perfect and we just have to trust that the thing works in actual situations. Studies have shown that around 40% of police chases in the United States have ended very badly, sometimes involving unsuspecting civilians. The PGB, as Stock claims, has been thoroughly tested in various vehicles which make it seem safe for use. Although there hasn’t been one that has been sold, Stock is keen and eager to do live demonstrations for interested agencies (and that includes you, Batman). Since the Police Grappler Bumper hasn’t made it to local police stations yet, the British police have their own way of bringing vehicles on the run to a complete halt. With TPAC or Tactical Pursuit And Containment maneuver, a series of methods are used to stop a fleeing vehicle. It includes rolling roadblocks, the use of Stinger spike strips, as well as the “box and stop” containment method that has been used quite often. Although some may say this hasn’t been the best way to stop fleeing law offenders, this is practically the only government-approved way. Until Stock’s Police Grappler Bumper is given the thumbs up from the higher ups, it looks like law enforcers will have to stick with the traditional method.